A diagnosis helps answer many questions, but it also creates many more. As overwhelmed and anxious as families feel with the news of a rare, genetic, and serious medical condition, a proper diagnosis is a turning point and an important and positive step in the right direction. In the world of rare diseases, Glut1 Deficiency patients can be counted as fortunate. Health issues and struggles certainly exist, but G1D is neither terminal nor progressive, and there is great hope for improvement in symptoms for most patients with a ketogenic diet. Glut1 Deficiency patients are generally a delight to all who know them and are cheerful, friendly, social, and positively perseverant in overcoming challenges. Additionally, the Glut1 Deficiency community has a dedicated team of experts and researchers working every day to help develop better and more effective treatments and improve the quality of life for patients and families. Hope abounds. We have compiled a list of resources below we hope will be most helpful to you as you begin this journey. 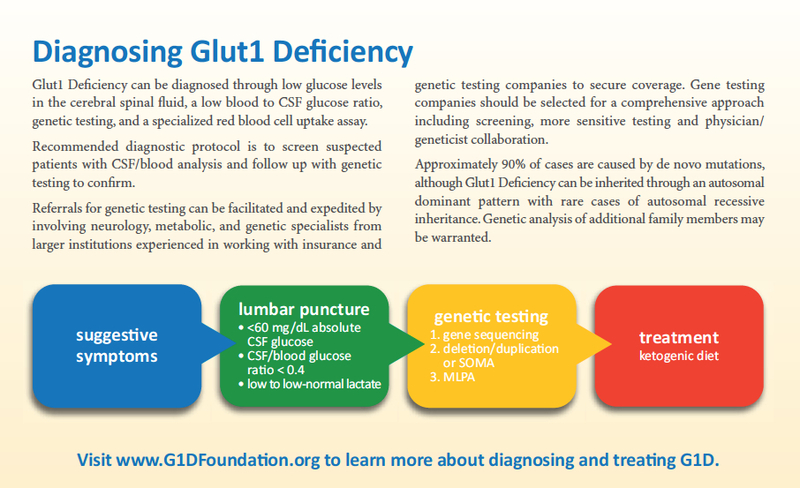 Also, please explore the website for more information on Glut1 Deficiency, especially under the Resources section. If you sign up for our mailing list, you'll receive a welcome packet of resources and information for newly diagnosed families.